Fermin V. Lassalle, age 92, of Orlando, FL passed away on Wednesday, January 30, 2019 in Orlando, FL. He was the husband of Sally (Gwizdala) Lassalle. Fermin was born on May 12, 1926 in Quebradillas, Puerto Rico; son of the late Juan and Maria (Velazquez) Lassalle. He was a 26-year U. S. States Navy Veteran, starting service in 1944. Service includes: RTC Sampson, NY; USS Antietam; USS Kearsarge; USS Orion; USS Roanoke; COM 10 San Juan, PR; USS Chilton; Atlantic Reserve Fleet Green Cove Springs, FL: USS Remey; USS Claud Jones; Naval Station Rota, Spain; Recruit Company Commander Great Lakes, IL, and retiring in 1970 as Signalman First Class. 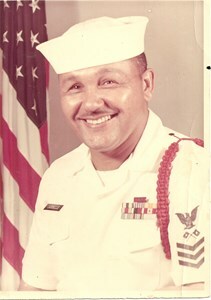 Besides his loving wife, Sally, Fermin is survived by his two sons, Marc Lassalle and his wife, Allison; Adam Lassalle, and his wife Taylor; his three daughters, Michelle Mack and her husband, Gamal; Yvonne Lassalle, and Elizabeth Lassalle; and six grandchildren, Tony Lassalle, Hayden Lassalle, Spencer Lassalle, Omar Mack, Hudson Jones, and London Lassalle. He was preceded in death by his parents: Jose and Maria, three brothers: Jose Lassalle, Manuel Lassalle, and Avelino LaSalle; and two sisters: Juana Garcia and Carmen Velez. A Funeral Service with full military honors will be held on Wednesday, February 6, 2019 at 12:30 pm, at Cape Canaveral National Cemetery, 5525 US-1, Mims, FL 32754. To share your memories of Fermin or leave a special condolence message for his family, please click the Share Memories button above. Add your memories to the guest book of Fermin Lassalle.